There's a magical story behind the Lalaloopsy Silly Hair Dolls from MGA Entertainment - why these dolls made the top ten hottest toys list this Christmas. The story is that these cute and precious dolls were once only rag dolls. True, they were cute - but they were ordinary dolls. However, once the final stitch was sewn, these dolls came to life and brought joy and delight in the hearts of every child who had one to cuddle of their very own. The dolls are said to acquire their sweet personality based on the kind of fabric they were made of. One of the dolls, Lalaloopsy Silly Hair Doll Crumbs Sugar Cookie, is said to have been created right from the apron of a baker. It's no wonder she's so delightfully sweet and that all the kids want her. She comes with pliable but strong hair that kids can easily bend into a style. They can make it curly or twirl it or even leave it straight. With this doll, kids get some hair styling tools to make fixing the hair a lot of fun. In the box, girls will discover the brush for the hair, a total of four clips and six cute beads to style the hair. But that's not all the Sugar Cookie model comes with. She also has her own adorable little pet! Sugar Cookie's pet is a mouse with yellow inner ears, a twirly pink tail and the same button eyes that makes the dolls so lovable. 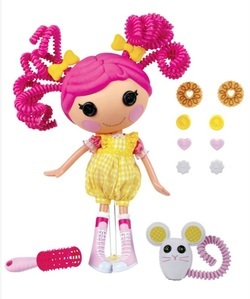 The pet's tail can also be decked out in a straight or curly style just like the dolls hair! Sugar Cookie's rag doll style head with the button eyes and replica stitch mouth make her so endearing your little one won't be able to stop hugging her. And wouldn't you know it, the adorable Sugar Cookie doll has friends! 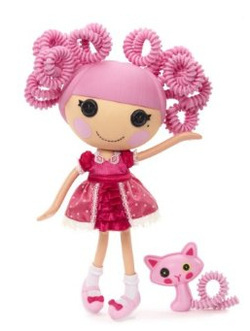 One of these must-have dolls who is her friend is the Lalaloopsy Silly Hair Doll Jewel Sparkles. Just like Sugar Cookie, this sweet doll has hair that can be curled into a style. She also has the clips and the hair beads for hours of fun for your child. You can see the amount of careful detail that went into the dress alone. Made in a dark burgundy color, it has a ruffle in the skirt and the outfit is trimmed in lace. Like Sugar Cookie, she comes with a pet, a little pink cat with a bendable tail that can be styled, too. Lalaloopsy Silly Hair Dolls from MGA Entertainment are so cute that they make great collectible gifts for people who like to collect special dolls. Make sure you get these dolls today and bring home some magic for those special people that you love. Like this top Christmas toy for girls, but more into pets than hairstyles? Take a look at the adorable Fur Real Cookie Puppy instead!